Tee Times Algarve Holidays – Medronho Festival and Traditional Presunto Fair – Monchique, Algarve – Portugal – 25th to 27th July from 4pm each evening. It was time to head to the beautiful Algarvean hills, to join in with 3 evenings of festivities in Monchique. 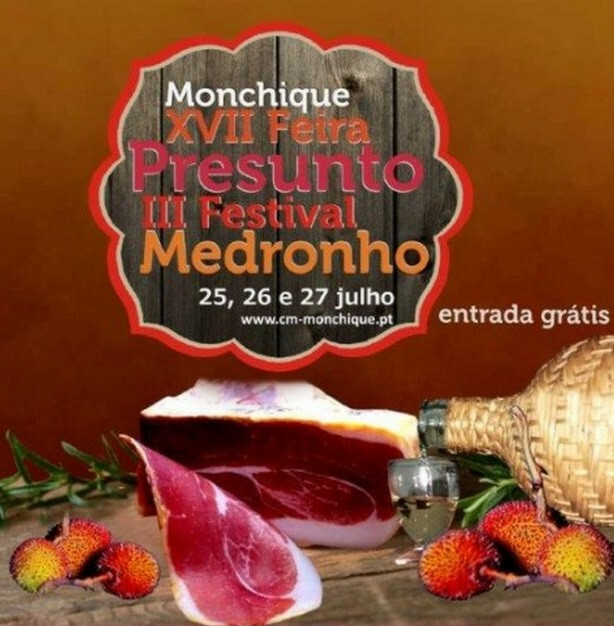 This festival celebrated the locally distilled drink of Medronho brandy, made from the red berry-fruit of the Arbutus unedo tree (‘Strawberry’ tree). Along with the locally produced presunto (ham), which is a traditional Algarvean cured ham. The people of Monchique are understandably very proud of both these traditional artisan products of the Algarve. Live Music and local entertainment was also provided. Monchique, well worth a visit in its own right, is on the north-west of the Algarve and at about 2952 feet (900 metres) above sea level in the Serra de Monchique has spectacular views of the Algarve coastline. This small market town is fondly referred to as the Garden of the Algarve. The local climate of Monchique is humid and subtropical, enables rich and lush growth of shrubs and trees. Including the exotic and rare Carvalho de Monchique, a Oak tree that is said to only grow in these hills. The Algarve has a spectacular selection of holiday accommodation. However, with such a fine choice of accommodation, making a decision of which to book can be difficult. Tee Times Travel Agency highly recommends Villa Termal Das Caldas de Monchique Spa Resort, CS Morgado Golf Hotel, Penina Hotel Golf & Resort, Pestana Alvor Praia and more. Quite close to Monchique is a small Spa town, called Caldas de Monchique. People have been visiting this town, since the time of the Romans, for its famous waters. The water, which is said to have healing properties, emerges from springs’ at 32ºC. For golfers wishing to experience some of the exciting courses along the Algarve, Tee Times Golf Agency recommends Gramacho, Morgado, Palmares, Peninas’s, Vale da Pinta, Vale do Milho Par 3 and many more.